We have been offering airport shuttle and transportation service in Laurel Maryland for nearly a decade, and a very active member in the community. Our car service kiosk in Laurel is equipped with advance dispatch technology that enables us to be prompt, fast and efficient every single time. The vehicles in our fleet are clean late model non-smoking cars and regularly serviced to ensure your safety, convenience and peace of mind knowing that you will get to your destination smoothly. 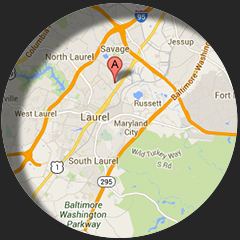 We service BWI, Dulles, Reagan and Philadelphia Airport 24/7/365. If you are in the area and need a ride to/from anyone of these airports, don't hesitate to make an online reservation on this secured site today, or call our dedicated customer service reps at 410-975-8200 to customize your trip now. Our rates are normally cheaper than the average typical filthy Laurel taxi. Drivers in our company are thoroughly screened and well trained to make sure you have a fantastic experience every single time that you utilize our services. You can check out the testimonials on this site to learn more about what other customers say about our company. We also offer hourly sedan service for individuals; families and friends who want to go on a night out for a fraction of what a limo service in Laurel Maryland would cost you. So feel free to give us a ring to arrange for your car today. Enjoy your ride and see you on the road.